A little over three years after her first crossing, Helena is back on the Atlantic Ocean. Destination: Canary Islands. On February 28th Rolf, Bart and Marga left Cape Town for the first leg to Ascension Island. An easy day again. We’ve got 142 miles to go and that means we should arrive tomorrow at the end of the day at Ascension Island. We are looking at a stay until Tuesday or Wednesday before we start our passage across the equator and towards the Cape Verdes and the rest of the northern hemisphere! We’ll be needing some supplies for this part of the trip and we have some minor maintenance to take care of as well. While we prepare we should be able to do some snorkeling, diving and hanging out with the 800 people living on the island. I’ve got a bad case of writer’s block today. I truly cannot think of anything special to mention on the daily update. We’ve had a good sailing day again and the sun was shining. We’ve all done our toilet visits and we all had a shower. We also had coffee at some point and also breakfast, lunch and dinner. To facilitate this we have used the stove and for some dishes we have not. Some of us have been reading, others were watching tv on the laptop. Bart and Marga had another Spanish lesson and I have done very important captain stuff again. Oh yeah, we got dressed today as well. Also, I drank a coke today and we all slept during the night at some point (although never all at the same time). We have also kept ourselves busy with washing up after the breakfast, lunch and dinner. A very interesting detail is that we have used the cockpit cushions to sit on while looking at the see and used the cockpit floor to put our feet on. Maybe tomorrow the day will bring us more or less of the same activities. It’s a nice sunny day today! We’re having some beautiful sailing weather again (yes we’re getting spoiled) and this morning we put the genakker back on. It was good that we took it down during the night since we got some strong wind gusts. Today we have been doing mostly 7 to 8 knots and in the afternoon the wind was down a bit again and now we’re sailing with a gentle 12 knots of wind and about 6 knots of speed. We’re slowly considering our options for after Ascension. We have some possibilities for landfalls on the Northern hemisphere and so we’re starting our planning for the longer term by now as well. Some of the options are stopovers in Dakar, Gambia and Western Sahara, next to the original plan for the Cape Verdes. We’ll let you know about our proper final plans before we leave Ascension. We have a little problem. The USB connector for the sattelite telephone has broken off and therefore we are now dependent on the SSB radio for sending the updates. We are now back in the middle ages where the weather information takes about 20 minutes to come in. Today we developed a new religion and Bart has started brushing up on his Spanish language skills under the strict and firm supervision of our own Spanish teacher Marga. We have made a very good distance today as well since we sailed through the night with the halfwinder and during the day with the genakker. Since we expect the wind to potentially pick up through the night, we have just taken the genakker down again and switched over to the genoa for the next night. It is looking good for an arrival in 4 days on Ascension. We’ve got all our supplies and fuel and we are underway again to Ascension Island. We took off this morning at 11.30 after coffee, breakfast, a swim and some last little jobs. We are expecting the wind to increase throughout the night and it should be nice with around 15 knots of wind in the next few days, so we’re hoping for a fast passage. Since it is only about 700 miles from St Helena to Ascension, we hope to make it in 5 or 6 days. We have spent 4 nice days on St Helena. We have seen Napoleon’s house and decided that he was a bit mad, we’ve seen a beach and a couple of trees. We also have enjoyed the small town on the island and realised that a mobile phone network is something really cool and useful. The anchorage/mooring field is quite interesting. It is situated on the northwest side of the island and there is a gentle ocean swell coming into the area. This results in a spectacular surf on the beach as this swell builds up to massive proportions on the gentle sloping coastline. This means that there was absolutely no way of getting ashore with the dinghy. The only way to get ashore is with a small local ferry which drops you off on the dockside while the top of a wave pushes it onto the concrete wall. You then have to jump quickly since the wave will roll past very quickly and the ferry drops about 2 meters down and away from the dock. They have some ropes hanging above the dock to assist in this acrobatic feat. This is really quite extraordinary and an interesting adventure by itself. Good day all! Today we had some good wind and we have been doing some great speeds. By now the wind has gone down a bit again, but we had a good run anyway. We hope to arrive at St Helena tomorrow, but we have not made a final decision on stopping there or continuing on to Ascension. After we send out this message, we will get the weather information in and then we will have a better view on the actual forecast. We will let you know tomorrow wether we arrived on St helena or are still underway. We have found some wind! We’re doing a nice 6,5 knots with the gennaker back on and 13 knots of wind. We have motored for roughly 30 hours and were getting really fed up with the noise so after our prayers to Aeolus, he finally decided to help us out a bit. We’re looking at another wind dip in the forecast in 2 days from now, which means that we will probably wait it out on St Helena instead of going directly for Ascension. We should reach St Helena in 2 days from now, so let’s hope for the best. We’re still well on track with the cooking contest on board and no dish has been served twice so far. The springbok from yesterday was great and today Bart and Marga were fighting over their specific risotto recipies. Apparently Bart has stolen some ideas from Marga by making some chicken on the side. This means that Marga now has to compete with her own idea, so we’ll see what is going to happen. I think I’ll make some pumpkin risotto tomorrow to defuse the situation. Since even the little bit of wind did not want to help us on our way across the meridian, we took down the genakker and taught the wind a lesson by starting the engine. So now we’re happily motoring along until the wind gives in and start blowing a bit again. Much of today has gone towards our most important jobs of the day like napping, celebrating, cooking and eating. Oh yeah, also the history of northern Europe has been a major subject today. A large cloud cover has come in today and it seems that we’ll be getting a bit of rain tonight. Probably good as well since a fine layer of salt is covering the entire ship after the first couple of days with rough seas. At least this may get washed off now. Oh yeah, since we crossed the meridian, we have now changed the ship’s time zone to UTC. This should be the last time change on board. For the report of the day, I would like to refer you to yesterday’s update. Still very light winds, still gentle and still lazy. There is not much to do really except laundry (forgot to mention that yesterday, YES we actually did something!) and the daily routines. Marga is now working a lot at her PhD and this afternoon we had a session with the sextant. Thanks to the introduction session that I have received in Singapore from our friend Tim Luker (Kittywake), we were able to determine our latitude upto 3 miles. However, because we are missing some tables for the meridian pass of the sun, we were unable to figure out our longitude. Luckily we have the GPS to help us out on the way, so we still know where we are. 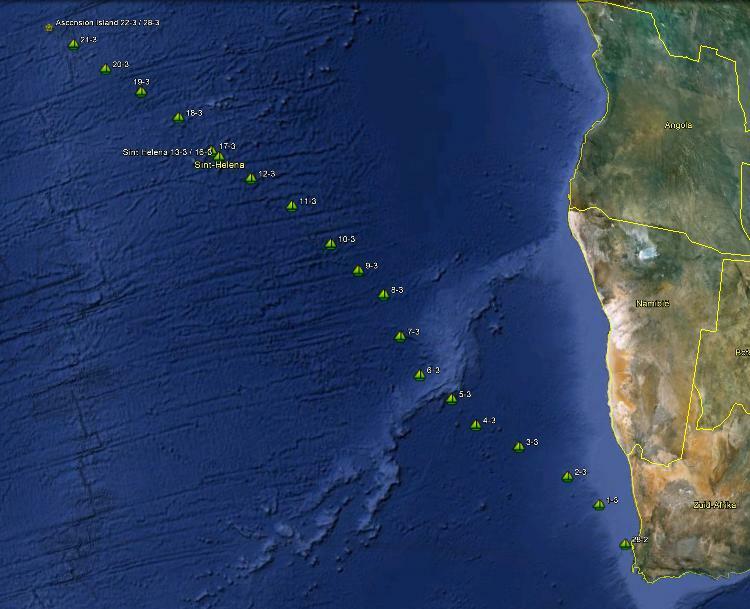 The way it looks now is that we will pass by St Helena in about four days. With a bit of luck we may get close enough for some mobile phone contact. Ok, I believe it is time to get rid of some misconceptions about this cruising for the people back home. It is not all the beauty and relaxing as we make you all believe. Honestly. It is not like the ship is gently rocking like a baby’s crib. It is also not as if we are doing nothing all day. Also the famous oorlam has not been re-introduced and especially not on the foredeck at 1700 with lounge cushions, rum&coke and crisps while the genakker is gently doing its thing in the light winds. It is also not like the sunshine is constantly warming us up or that the sun sets in a very beautiful way with some light clouds to create a fantastic contrast. There is no guitar playing throughout the day and there is definitely no music on while doing the dishes. The meals are really not as nice as we describe and we do not eat icecream all day. We’re lucky if we can fit in a noodlesoup. Also the atmosphere is not the best. We’re constantly tired and we really don’t like each other that much. Another thing that is absolutely wrong is that I am honest in writing all this. Really, it is another horrible day on the ocean. The ship is calmly moving about on the small and gentle ocean swell. The sun is shining and the sky is as blue as… well it’s nice and blue. the wind is gone and it will stay that way according to our forecasts. With the gennaker (asymmetric spinnaker) we can move with about 4 knots and we do not have much more to do than sit back and wait. Short and long conversations pass by while we do our daily routines with the logs, plotting our position on the chart, naps, engineroom checks and of course the daily kitchen activities for breakfast, lunch and dinner. An occasional small cloud comes by every now and then to check us out, but there is not even the slightest indication of rain, wind or any other kind of weather, except sunshine and easy and gentle weather. So, we are relaxing a lot and I’m quite happy to say that this is also very nice. After the last few passages with strong winds, tight windows and rough seas, this is a very pleasant way of sailing. It’s slow, but steady and comfortable. I am now convinced that the tropical Atlantic has some kind of agreement with Helena. The passage we made from the Canaries to the Caribe was also as quiet as this, even quieter. Although this one is so far a lot more comfortable because we have no big roll at all. Of course, right on the moment that I write this, a strange wave comes by and rolls the ship heavily as if the ocean tells me not to take anything for granted. We’ll keep the lightwind sail up for the night since we do not expect any more wind than what we had today. We have been talking about the 2 events which will mark our trip towards the canaries. First of all we will be passing the meridian. This is the line that devides the eastern and western hemispheres and is located at… yes, well that should be 0 degrees East or West. Of course the tradition is that this should be celebrated so we’re thinking up different ways to celebrate this event which should take place somewhere in the next few days. The second event which we will encounter along the way is of course the equator. There is a long standing sailing tradition that you should shave your head when crossing the equator for the first time (check out our website and look for Manihi and you will find the bald brinkies). Since Marga is not so enthousiastic about shaving her head and Barts hair is already too short to make this into a spectaclular event, they are trying to think of something to do on the equator. Learn and sing the national anthem of the nearest country (cape verdes probably) while hanging off the bow dressed up as a mermaid. Since it will take quite some time before we reach this second event, we will keep you posted on any other ideas that may develop. It was a nice and very calm, beautiful day on Helena today. The wind is still low and around lunchtime it picked up slightly to around 11 knots so we decided to run with one of the light-wind sails. We spent the afternoon enjoying this and have just taken it down for the night. We do not expect any high winds for the night, but we have a somewhat delicate course to maintain to stay out of the way of a couple of large reefs, the left-overs from an ancient island, about 60 miles ahead of us. This means that we may have some difficulty running with the lightwind sails on a slightly odd wind angle. Tomorrow we should have passed this area and then we plan to use these sails more often. We have started the usual poll again about the arrival dates and times for Ascension Island. It is still about 1600 miles to go, so the results of the poll are all at 17 or 18th of March. We’ll see what happens and hopefully we’ll be even faster! In the mean time we have set the standards for the cooking. Since we supplied for 4 people and are only sailing with 3, we have tons of food on board. With all this food we try to make some proper 5 star meals. The first creations include chicken cordonbleu, quesadillas, asian beef curry and (yes really!) banana icecream! It has been a very relaxing day today! The wind was gone and we have been sailing with only 3 to 4 knots of speed, but this also means that the confused seas we had are finally gone! Right now the wind has picked up a little bit again and we’re gently moving through the calm ocean around us. No rock’n roll for now so we’re enjoying it while it lasts. This afternoon we were enjoying a (soft)drink on the foredeck with our feet over the side, trying to lure some sharks while discussing the meaning of life and looking out over the endless ocean. These are the moments when you can appreciate the immense size of the ocean and our size on it. We’re hoping for a good night of sleep and are now going to have our icecream which we made today with all the bananas that have to get eaten soon! The winds have finally gone down, but the seas will take some more time to settle so now we’re rolling a lot. We are getting a lot of currents and mostly they are pushing us southwest and with the southerly winds, these currents have been building up the seas a lot. We’ve had some crazy waves crashing over the ship last night, but now everything is a lot calmer. Tomorrow the waves should go down to a nice level, but the wind is forecast to go down quite a bit as well. We have changed course today to make sure we stay clear from the Valdivia Banks, an area of underwater mountains which almost reach the surface. Tonight is movie night and in a few minutes we’ll start watching Django Unchained. Oh yeah, before I forget, we changed the clock with one hour today so we’re on European time now. We are having good winds, although gusty up to 30 knots and a very rough ocean with steep waves, but we are making good progress. We are enjoying the speed while it lasts, since the forecasts show the wind to decrease again by tomorrow evening. This is at least a good way of getting used to the ocean. We have some strange currents around which seem to cause the seas to build up so much and every now and then we’re sliding sideways of a steep one to give us a bit of a splash and a lot of noise. No worries, Helena is very well up to the task and we’re all chilling in the cockpit and are not in the least worried. Marga is cooking some polish stew tonight and Bart is trying to figure out why his t-shirt seems so much smaller after a month of south african food and beers. We’re reading our books most of the time and we’re listening to a lot of radio traffic which seems to come from nowhere. We’re attempting to solve the world’s immigration and religion problems and probably will come up with a great plan which will likely never be implemented simply because the world leaders don’t take some silly ocean sailors all that seriously. This morning we had somewhat steadier seas and therefore we were able to steady ourselves a bit as well. Yesterday was really a bit rough and we had very confused seas due to a low pressure system which came by the day before. Right now we are experiencing similar seas again, but now we can weather it a bit better after the opportunity to get used to it. This means that now I can finally introduce the new crew member Marga to you all. Marga is from Poland and was on the standby list for a while. Bart and I are very happy with her presence on board. We are having a very good time and are enjoying many conversations about pretty much everything. We are still having some low temperatures here so we’re wearing sweaters a lot and the night watches even include a blanket for all of us. We’re looking forward to getting to the warmer areas again. We have made some good miles so far and expect to continue with good speed for at least the next 2 days, although we are currently having about 1 knot of current against us. We’ll start short this time. It’s a bit rough and seasickness is around the corner. Therefore just a quick one. We’ve got a different crew again. John and Marco have left us and we now are sailing with Marga as their replacement. Yes, she counts for two here on board! We sailed out of Cape Town around 1530 this afternoon with 30 knots wind. All is well and we just finished dinner. Tomorrow we should be more used to the confused seas again, so till then!